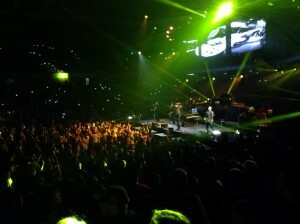 A crowd of more than 30,000 packed the Georgia Dome on Saturday, February 9th to gather for Winter Jam 2014, the largest show in the tour’s nearly 20-year history. 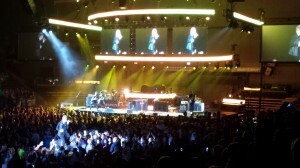 The annual Christian music spectacular, which has earned its place among the year’s top-grossing tours, visited Atlanta as part of its string of 47-city concert dates with a remarkable ticket price of only $10 per attendee. Admission offered fans complete access to the daylong event, which boasted an incredible lineup of today’s biggest names in Christian music, some very special guest speakers, and many other unique appearances. Highlights from the event included performances by Newsboys, Lecrae, Tenth Avenue North, Thousand Foot Krutch, Plumb, NewSong, Colton Dixon, Love & The Overcome, Everfound, and Derek Minor, as well as a special high wire act by Nick Wallenda. 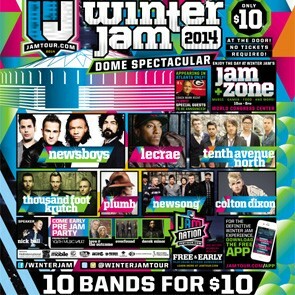 Winter Jam 2014 in Atlanta also marks a historic milestone for the tour due to its increase in popularity and record attendance, ultimately outgrowing the capacity of nearly 20,000 at Philips Arena, and hosting the event in the Georgia Dome for the first time. The expanded capacity not only permitted more fans from the neighboring states of Tennessee and Alabama to take part in the festivities, but also allowed for larger production. In addition to the incredible performances, inspirational speakers, and record attendance, the tour also marked the largest night of sponsoring in the festival’s history with over 500 attendees sponsoring a child through Holt International.